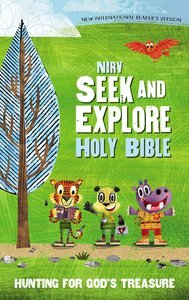 About "NIRV Seek and Explore Holy Bible"
The NIrV Seek and Explore Holy Bible is about engaging the child's whole being-heart, soul, and mind. This Bible helps children understand God's Word by utilizing the nine common ways that children learn: Logical reasoning; Visualizing; Discussing and debating; Learning with others and using interpersonal skills; Reflection or intrapersonal skills; Emotional engagement; Experimenting and doing; Kinesthetics; and Nature. Children are joined on their journey through the Bible by nine different animal friends who are each designed to help kids use one of the nine different ways of learning. Endearing art of an antelope, monkey, African elephant, meerkat, hippo, tiger, jaguar, panda bear, and zebra guide children from "Base Camp" to the different sites throughout the Bible that lead them through the story of God's people.